Adam covers how he approaches backup and soloing, and teaches 7 of his solos. 4 hour and 20 minutes on 2 DVDs - with booklet. 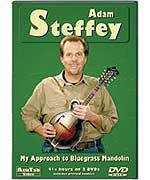 It's hard to believe that a player as influential and widely admired as Adam Steffey is just now releasing his first mandolin instructional DVD. Adam has performed and recorded with some of the most prestigious groups in bluegrass music, including Lonesome River Band, Alison Krauss & Union Station and (currently) Mountain Heart. He has a CD of his own, and has been a featured guest artist on dozens of others. This new 2 DVD release from AcuTab contains 4 hours and 20 minutes of insight, instruction, tunes, tips and technique from the 5 time IBMA award-winning picker. On Disc 1, Adam goes over several topics, including chop rhythm, right hand attack, note spacing, tone/volume, practicing and building speed - with demonstrations of each in turn. He then spends roughly 45 minutes covering how you can build a bluegrass-style solo based on the basic melody of a song. Using 3 common jam tunes, Adam shows how to start with the simple melody and build a solo - in several keys. Disc 2 has Adam teaching his solos for 7 tunes he has recorded. You'll learn Everytime You Say Goodbye, Liza Jane, No Place To Hide, #6 Barn Dance, Cluck Old Hen, East Tennessee Blues and Daybreak In Dixie. Each song is played with a band before Adam breaks it down lick by lick.They are each then shown (fast and slow) in a split screen orientation. On both disks, Adam takes great care to present the material in such a way that even new pickers can benefit from it. The first tune taught on Disc 2, East Tennessee Blues, is covered in particular detail, and would be appropriate for even a novice player to learn. More skilled mandolinists will find much to challenge them throughout. One benefit of the DVD format is the ability to offer alternate angles of the same shot, which we use on the various split screen presentations. The viewer can select among three different screen orientations while the DVD is playing. Download now from PlayBetterBluegrass.com !